Lee F. Richards, 73, died at his home on November 5, 2015 while surrounded by his loving family. A memorial mass will be on Tuesday, November 10th, 10:00 am at St. Mary’s Church, Canton. He is survived by his wife Deborah “Debbie”, his mother, Lorraine Richards of Norfolk, daughter and son-in-law, Wendy and Matthew Denner of Heuvelton, brothers, John and his wife Gerry Richards of Norfolk, Jeffery Richards of Norfolk, Robert and his wife Nancy Richards of Norfolk, grandchildren, Matthew Denner Jr., Gregory Denner, Quinton Denner and Landan Denner, several nieces and nephews. Lee was born on June 28, 1942, in Norfolk, New York, the son of the Vernon and Ione Lorraine Butler Richards. He graduated from Norwood Norfolk Central School and married Deborah Johnson on September 20, 2008 at the Hermon Methodist Church. He worked as a driver for Enterprise in Potsdam, before that he was a manager at the Agway Fertilizer and Feed in Canton and Agway in DeKalb Junction. He was a member of the Sons of AM VETS Post 11 in DeKalb Junction, the Waddington Golf League and the Old Timers Softball League. 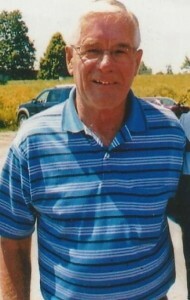 He enjoyed playing golf, bowling, playing softball, most of all he loved attending all of his grandchildren’s events. Lee was outgoing and always had a joke to tell. Contributions can be made to the Hermon Fire Department or Hospice and Palliative Care of St. Lawrence Valley.